Beautiful ethnic Kantha quilt/bedspread/throw/blanket made by artisan women in Jaipur, India. This double layered quilt is first screen printed and then embroidered over in the Kantha technique and is overflowing with a kaleidoscope of colors and patterns! Smooth cotton overflowing with gorgeous floral designs in a multitude of vibrant colorful shades makes for a very ethnic piece that is sure to add a dose of cultural magic to any room! 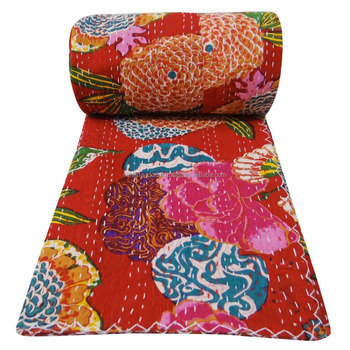 Use it in so many ways: as an elegant ethnic throw for a sofa or bed, a beautiful and radiant bedspread, or a blanket! This beautiful piece is expertly crafted by artisans who have been engaged in the craft for generations! Don’t miss out on this perfect opportunity to add ethnic and cultural authenticity to your home at a price you can't find anywhere!!! Wash in lukewarm water with mild detergent, or dry clean for best results.